The professional method for examining fuel mixture in real time. Much more accurate and faster than EGT, or any street-based sensors. Requires 12VDC power and adapter cabling. Through analysis of the remaining oxygen, LCU-ONE points out possible oxygen excesses/lacks in the carburetion, providing essential information for 2/4 stroke engine tuning. 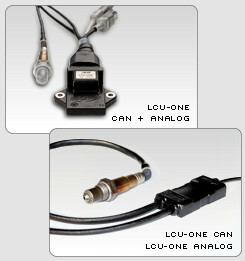 Lambda Sensor Installation Kit Weidment, Power, and Signal wiring to plug-and-play Lambda sensor to your logger.